From December 11th, 2018 until January 8th, 2019 the Christmas events will be active again! Please see the next few posts for further details. Objective: Collect the following items (10x Wax, 10x Glass and 10x Rope) in the Collector Fields and bring them to Bozman. The premium battery cannot collect event items. He will reward you with the following:. Objective: Collect 25 Christmas Spirits from monsters (level 15+) and bring them to Ruby. She will reward you with the following..
Quest Item Name Description Amount Bound? Objective: Collect a Magic Stick (from monsters level 15+) and upgrade it to receive amazing rewards or even the new Christmas Dinner Accessory Set! At +20 Magic Stick you can get all the accessories ? You can choose which set you want. 1 +20 magic stick is 1 set of your choice. Can we use the old magic stick from last year? Yes, the sticks are the same as those from last year. Can I ask on the tree event (collect candy canes add to tree exchange for prizes) are the prizes bound to character? or can they be swapped? The items you get from that event are soul-linked. Last edited by Pabo; 11-12-18, 12:15 PM. I understood that and those rewards are still soul-linked. I don't see the shield mentioned you can get for 1k Golden snow flakes…. what it contains. Stats or just skin? 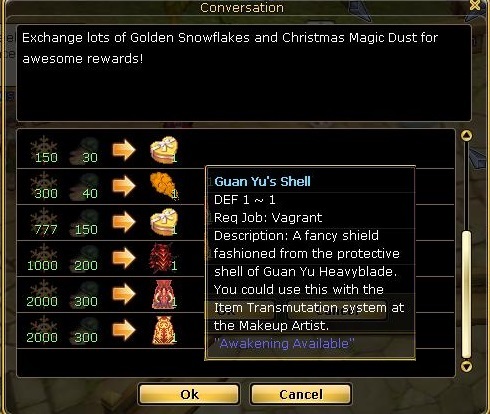 Yes We can get Guan Yu"s Shell (shield) from Daddy Snowman for 1000 Golden Snowflakes + 200 Christmas Magic Dust. Last edited by Pabo; 12-12-18, 06:42 AM. Hi good afternoon! Since the event started I am trying to collect in the area collecting with collector +5 the items Wax, Glass and Rope, but so far has not collected any. Can you let me know if this is an error in the event or if you changed that? What kind of battery do you use ? Is it a Premium Battery ? I have no problem with silver and gold batteries. Last edited by Pabo; 11-12-18, 05:23 PM. I use the premium 1 day. I changed the battery to silver and started collecting. I find it very strange that you are only collecting the batteries of another and silver. Last year we even collected with the batteries bought in the NPC. I honestly did not like it! Last year the Premium Battery did not exist. It is a fairly new item meant to collect required quest items for the most recent update. I think they should have mentioned somewhere that Premium Batteries do not work for this event. All times are GMT0. This page was generated at 01:48 PM.